It's summer! Which is exciting for a lot of reasons. The garden's been planted. Soccer season is in full swing! (thus far, our record one win, one tie) The sun rises early and I can go out for lovely early morning runs. The days are warm or HOT, and I can wear dresses and skirts to my heart's content. So much great stuff about summer. But one other thing summer means: I'm super busy. And even when I have some free time, I don't often think about knitting. Makes sense. So, if this blog doesn't get many posts in the coming weeks, don't say I didn't warn y'all. 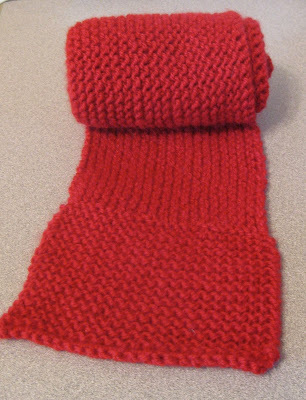 But here is my latest, and boring, knit. Just a plain red garter stitch scarf. Not sure when or if I'll wear it... But it was a good way to use up some scrap yarn. Hope everyone is having and has a great summer!